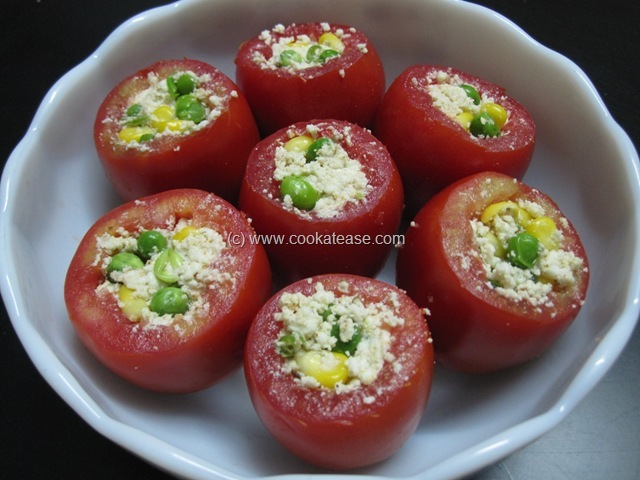 Here is paneer filled baked tomato. 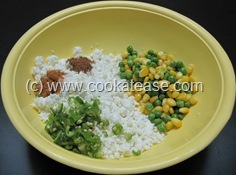 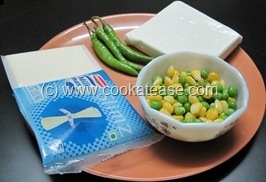 I have used paneer or cottage cheese with some sweet corn and frozen peas, as filling in oval shaped tomato. 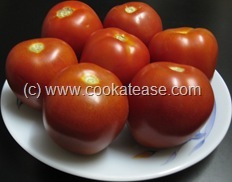 This baked tomato is rich in taste with less spices and is colourful to attract children also. Boil peas and sweet corn; cut the top of the tomato, scoop out the seeds and juice (this can be used in any other dish); crumble paneer and add with boiled peas, sweet corn, chopped green chilli, salt, lemon juice, cumin, garam masala powder; mix gently. 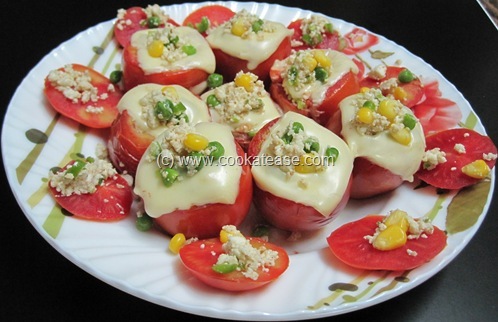 Now fill each tomato with paneer stuffing and bake them for 15 to 18 minutes at 200 degree Celsius temperature; keep some stuffing to garnish baked tomato; meanwhile cut the cheese slice into small square pieces to cover the top of tomato. 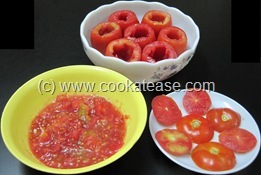 Remove when tomato is little soft and with slightly cracked skin; when tomato is still warm, cover each tomato top with a cut cheese slice piece; cheese will slowly melt and stick on tomato. Garnish the baked tomato. 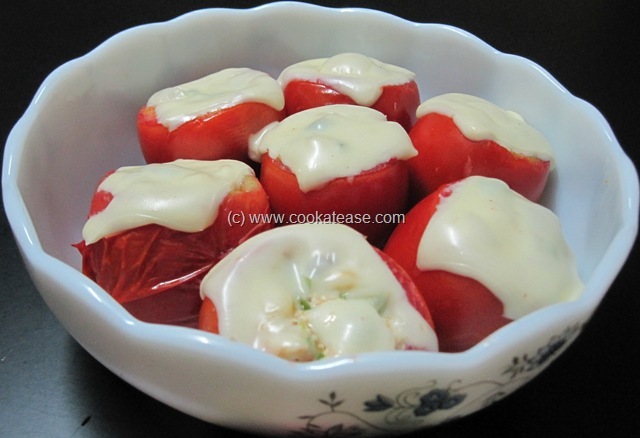 Now colourful healthy Paneer Stuffed Baked Tomato is ready. 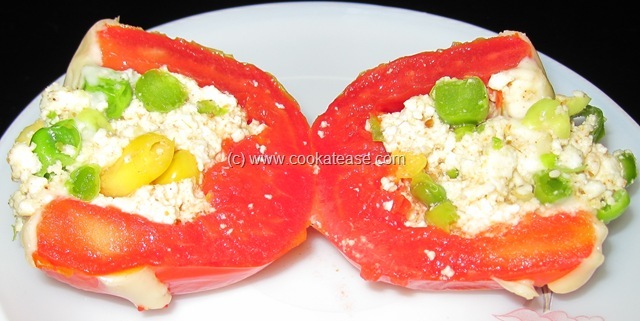 Here is the cutaway section of the paneer stuffed baked tomato. 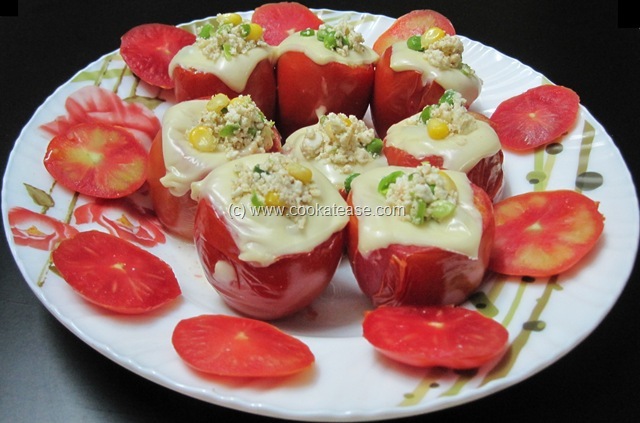 looks colourful, filling and attracting Kamala! !